The problem with writing the reviews for the Ipswich Magical Society lectures is that I have seen so many good ones now it is difficult to keep coming up with something new and original to say. Well with Michael Close I don’t think I am going to have that problem. There can be no doubt that this was a real lecture, and not just some old magician flogging his latest wares. I have nothing against dealer dem. style lectures where a trick is shown, explained, and sold. Shown, explained and sold etc. In fact it was not so long ago that this was exactly the sort of thing I wanted to see. But isn’t that such a waste of an experienced magicians knowledge? I am at the stage in my magic now where I really do want to get better at what I do, and no amount of buying the latest “amazing, all singing, all dancing magic effect” is going to do that for me. So when someone like Michael Close visits, and lectures on how to be a better magician. On how to scrutinise every move you make. On how to look at an effect and work out what it would like if it were real magic happening, and then change the effect until that is exactly hat it does look like. On how to solve all the little problems a trick has that can turn it from a good trick to great magic. Well that is exactly the sort of lecture that I would expect from a big name in magic like Michael Close (and make no mistake. He IS a big name in magic). It’s true much of what he had to say was common sense. Isn’t that always the way when we hear great words of wisdom? When you read a book like Ortiz’s “Strong Magic”, at the end of the day, isn’t that not just common sense? Some have said that Michael Close comes across as being very arrogant. I suppose much of this reputation could have stemmed from his regular “no holds barred” reviews that he used to do for Magic magazine. Whether you agreed with his reviews or not (and yes, we did have a choice), they at least provoked genuine magic discussion amongst the fraternity. But I digress. Back to his so told arrogance. It is true to say that during his lecture his self confidence was very evident. I guess one question to ask is where exactly does self-confidence become arrogance? I say this because why the heck should he not be so self-confident? 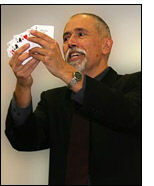 He is in my opinion, one of the best living close-up magicians alive today. Not only that, but he is also an extremely skilled Jazz Pianist (I know, I was the one that bought the music CD), but also a talented comedian (judging by the jokes he told in the bar after the lecture), and certainly no beginner in the ancient art of origami. I am sure I could go on listening other talents, but to put it simply, it highlights the fact that Michael Close likes to do his best at whatever he turns his hand at. So when it comes to magic, if he can share just of few of the secrets that helped him achieve what he has achieved, then I am thankful for that. Arrogance, or no arrogance. It may very well be true to say that during the lecture he showed little of the humility that perhaps someone like Michael Ammar showed but that was whilst he was working. Talking to him and his lovely wife Lisa in the bar afterwards (to the early hours of the morning I add) they really were just a regular couple, telling jokes and anecdotes with the rest of. Anyway, back to the lecture. The effects he did demonstrate were simply there to reiterate what he was saying. With each one he would not only explain how it was done, but where he had problems with it, and how he changed it to get over those problems. Perhaps in some cases the changes were minimal, but if he could improve the effect just a fraction then to him, ever the true professional, it was a worthwhile change. It certainly made me want to rethink everything that I do. I will definitely be re-evaluating my regular set and I will take each effect one at a time and look for ways to improve the way they work and they way I perform them. Perhaps this is where some think he is arrogant? “Who does he think he is, trying to improve (for example) a Dai Vernon effect!” Well I think anyone that says that is missing the point entirely. Just to add a bit of controversy, I will say that one of the effects he did at the lecture I have never been that keen on. It was Simon Aronson’s “Side-Swiped” and before anyone says anything, for the most part I really love Simon Aronson’s work. I believe that material like his “memorised stack”, “Shuffle-Bored”, and the “Undo principle” from “Try the Impossible” (to mention a few) are some of the strongest magic I have ever seen or performed. In short he is one of my idols in magic. For me though, there is a fundamental flaw with Side-Swiped. Perhaps I gave up on it too early and need to do what Michael Close talks about and see if the problem that I have with it can be solved. However, taking my dislike for it aside for a moment, he has combined it into a routine with Bob Farmer’s “Bammo Card Walloper” effect, and demonstrated very simply how important it can be to combine multiple effects to create a free flowing routine. He also demonstrated the synergy you can get with two effects and how they can have a symbiotic relationship. I really could enthuse on and on why I thought this lecture was so much better than many others I have seen. I do appreciate though that not everyone will share my opinion. One of the reasons I enjoyed his “Workers” set of DVDs so much is for the discussion sections he had with Michael Ammar and Eric Mead. It’s probably why I also enjoyed this lecture so much. I think he has a lot of interesting, informative and vital things to say on the subject of (just one of his passions) Magic.